These diagrams illustrate Napoleon's theorem. In the top left diagram, the triangle ABC has no special properties to speak of, but if you construct equilateral triangles pointing outwards from its three sides, then the centers1 of those three triangles form another equilateral triangle. (It's the light orange one in the diagram.) 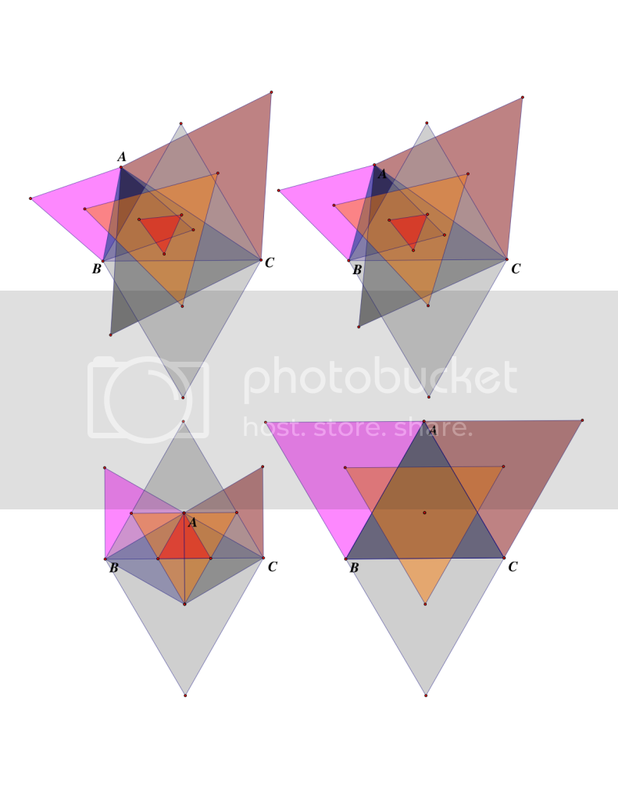 If you construct equilateral triangles pointing inwards from the sides of ABC, and then connect the centers of those, you get another equilateral triangle, centered on the first. (It's the dark orange one.) These are called the Napoleon triangles, and the difference in the areas of the two Napoleon triangles equals the area of ABC! If ABC is equilateral, then the inner, dark orange Napoleon triangle shrinks to a point, as in the bottom right diagram. The bottom left shows what happens if ABC is isoceles, and the top right shows what happens when I try to make the sides of the two Napoleon triangles parallel. I'm pretty sure that there are infinite points I could move the A vertex to that would cause that to be true, and I think that they might describe a circle. This has been your daily triangle geometry update. Now, back to bending LaTeX to my will. There are a lot of ways to define the "center" of a triangle. Conveniently, if it's an equilateral triangle, the definitions all agree. You refer to the top left twice. I think you meant top left the first time, and top right the second time. It usually takes me a couple of tries to associate the knobs on the stove with the correct burners. Damn, that is interesting work. I'm formatting Word documents today. "Napoleon's theorem has a very beautiful generalization in the case of externally constructed triangles: If similar triangles of any shape are constructed externally on a triangle such that each is rotated relative to its neighbors and any three corresponding points of these triangles are connected, the result is a triangle which is similar to the external triangles (Wells 1991, pp. 156-157)." What does similar triangles of any shape mean? And what does each is rotated relative to its neighbor mean? That if one is rotated by say 60 degrees clockwise so are the other two? Just trying to make sense of this. My best guess would be that "of any shape" just means that the triangles constructed on the three sides need not be equilateral, and that "rotated relative to its neighbor" means that if, for instance, side DE of triangle DEF is shared with side AB of the main triangle, then side EF of a different (but similar) version of DEF is shared with side BC, and that side FD of another different (but similar) version of DEF is shared with CA. In other words, if the triangles constructed on the sides of ABC aren't equilateral, then it becomes important which side they share with ABC, so you have to choose the shared side in a principled way. Oh, Amal has been doing that for a while, based on Matthews and Findler. With this multi-language stuff, I'm pretty sure I'd go insane without it.